Places in the main draw at the Seamaster 2019 ITTF World Tour Hungarian Open at stake, on the second qualification day, Wednesday 16th January, there was no room for error. …………The previous day Hong Kong’s Jiang Tianyi, the 2015 champion had been soundly beaten by Spain’s Carlos Machado 11-7, 13-11, 11-8, 11-8); in the third preliminary round both Daniel Habesohn, the winner in 2014 and Yan An, successful in 2017, departed. Daniel Habesohn was beaten by Belgium’s Florent Lambiet (11-7, 11-8, 9-11, 11-3, 9-11, 6-11, 11-8); Yan An suffered at the hands of Frenchman Emmanuel Lebesson (11-9, 9-11, 8-11, 6-11, 11-9, 11-6). …………Performance of the day, the vote goes to German pen-holder Qiu Dang; he caused arguably the biggest by beating Portugal’s Tiago Apolonia (6-11, 11-8, 11-9, 11-7, 11-6), before reserving his place in the main draw courtesy of success against Slovakian defender Wang Yang (11-4, 11-6, 11-5, 9-11, 11-9). 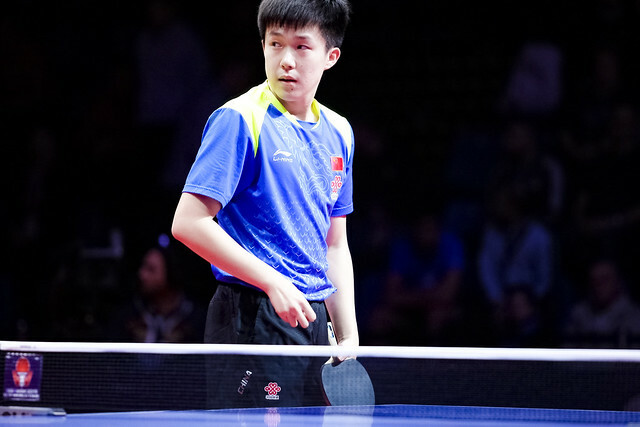 …………Tension packed contests to gain main draw places; there was no shortage, the most dramatic the win recorded by China’s Zhao Zihao in the decisive fourth preliminary round of the men’s singles event. In a seven games duel he beat Chinese Taipei’s Lin Yun-Ju (11-7, 6-11, 11-8, 6-11, 11-6, 11-13, 15-13). …………Reigning African champion, Quadri Aruna bid farewell in men’s singles preliminary round three; he was beaten by Russia’s Alexander Shibaev (7-11, 11-13, 11-5, 11-5, 11-9). …………Hard fought contests in the third preliminary round of the women’s singles event, the round to decide main draw places; none was closer than the battle of the generations. Singapore’s 23 year old Zeng Jian beat Luxembourg’s 55 year old, Ni Xia Lian by the very narrowest of margins (12-10, 8-11, 11-6, 5-11, 9-11, 11-9, 11-9). …………Commonwealth champion and voted 2018 Breakthrough Star of the Year, India’s Manika Batra maintained her form of last year. She secured a main draw place, she beat Spain’s Galia Dvorak (10-12, 13-11, 11-4, 11-5, 11-6), prior to accounting for Romania’s Daniela Monteiro-Dodean (8-11, 11-8, 11-8, 10-12, 11-4, 9-11, 11-7). …………In the women’s singles qualification event, it was mixed fortunes for China’s Youth Olympic Games gold medallists. Gu Yuting, the 2010 winner, was beaten in round three by colleague Wang Yidi (9-11, 11-9, 11-8, 11-7, 10-12, 9-11, 11-5). Conversely, Liu Gaoyang successful in 2014, booked her main draw place by overcoming Monaco’s Yang Xiaoxin (11-6, 12-10, 11-3, 11-6), as did Sun Yingsha, the winner last year in Buenos Aires. In round three she overcame colleague Hu Limei (4-11, 11-3, 11-6, 11-4, 12-10). …………Notable performances in the preliminary stage of the women’s singles event but if one player kept cool, calm and collected it was Laura Gasnier of France. She recovered from a two games to nil deficit to beat Britt Eerland of the Netherlands (10-12, 9-11, 11-6, 12-10, 11-8, 8-11, 11-7), before overcoming the defensive skills of Ukraine’s Tetyana Bilenko (11-4, 8-11, 7-11, 11-9, 11-8, 11-3) to reserve her main draw place. …………Bernadett Balint and Mercedes Nagyvaradi very much flew the flag for the host nation; they beat India’s Manika Batra and Archana Girish Kamath (11-6, 11-5, 5-11, 5-11, 11-3) to book their place in the women’s doubles main draw. …………Serbia’s Aleksandar Karakasevic has proved himself a most worthy mixed doubles partner, partnering Lithuania’s Ruta Pakaiskiene he has won the European title four times; in the second preliminary round in Budapest he once again demonstrated his skills; this time in harness with colleague Izabela Lupulesku. The duo recovered from a two games to nil deficit to beat Luxembourg’s Luka Mladenovic (12-14, 9-11, 11-8, 11-7, 11-7).